Happy National Coffee Cake Day! Coffee cake is defined as "a cake, often cinnamon flavored, drizzled with white icing or crumb topping, and usually eaten with coffee." Searching through recipes, this Blueberry Sour Cream Coffee Cake caught my eye. My guys love blueberries, and cinnamon, and glaze, so I knew it would be a hit. Unfortunately, I could not get fresh blueberries, so I went with frozen wild blueberries. And I don't know what it is, but I always struggle with dividing batter. I didn't get perfect layers, and despite being tossed with some of the flour, the berries sunk to the bottom of the cake in a few spots. No matter, it still tasted amazing. You'll notice there are no pictures of the sliced cake. My guys descended on this cake like a pack of hungry wolves, and they weren't concerned with leaving me pretty slices to photograph. Maybe next time. Thank you to Susan W. for sharing her recipe, I'm looking forward to making this again with local blueberries, and with strawberries too! Thanks so much to Wendy from A Day in the Life on the Farm for hosting, and to the #FestiveFoodies for sharing their recipes, be sure to check them out using the links at the bottom of the post! Preheat oven to 350°. In a large bowl, cream butter and sugar until light and fluffy. Add eggs, one at a time, beating well after each addition. Beat in vanilla. Combine the flour, baking powder, baking soda and salt; add to creamed mixture alternately with sour cream, beating well after each addition. Spoon a third of the batter into a greased and floured 10-in. tube pan. Combine brown sugar, flour and cinnamon; sprinkle half over batter. Top with half of the berries. Repeat layers. Top with remaining batter. Bake 55-65 minutes or until a toothpick inserted near the center comes out clean. Cool 10 minutes before removing from pan to a wire rack to cool completely. Combine glaze ingredients; drizzle over warm coffee cake. Yield: 10-12 servings. Haha...you need to train them better. My family always asks if I have taken my photos before they eat LOL. It's not easy belonging to a food blogger. I never put sour cream in cake. Sounds like a great choice! My guys claim not to like it, but they loved this! You can just call it "fruit at the bottom" coffee cake! Sounds delicious! I don't think it matters if a few blueberries fell or if your layers aren't perfect ... who cares - I bet it tasted AMAZING and it looks incredible! Yeah, while I was whining about the imperfect layers to the guys, they were tapping their feet and saying, "We don't care, we just want to eat it!" We love blueberries so I know this will be a winner in our house! This does sound delicious with that glaze! I would descend on this cake too! 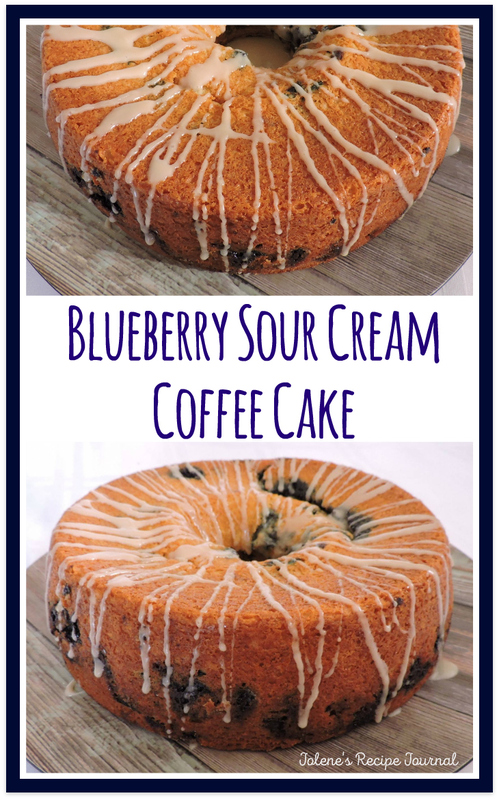 I had a similar coffee cake once before with blueberries and walnuts and I loved it but lost the recipe. Can't wait to try this one. My guys are nut allergic so I don't use them, but I bet you could add them to the cinnamon layer and it would be amazing!